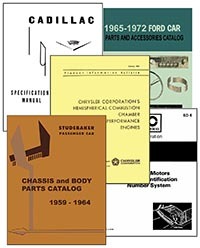 This Section Contains Factory Bulletins, Parts Catalogs, Technical Supplements, Performance Supplements, and Other Factory Published Information. This Section contians documentation and other materials released by each Manufacturer - all downloadable in PDF format. You may peruse the files by brand, then by year, and then by the individual publication. You may use the red "Search Site" button at the left to narrow your search. There, you may search by a "key word", or by make, model name, published name, or type. If you are seeking Assembly Manuals or Service Manuals - click HERE to go to that special section. PLEASE NOTE: Due to certain original publisher imposed and mandatory copyright restrictions, you must be a Society Member to access this Section. If you have any questions about what we have in Assembly Manuals or Service Manuals section, prior to joining as a member, please contact librarian@ahpsoc.org.